Piech has led VW for 18 years. 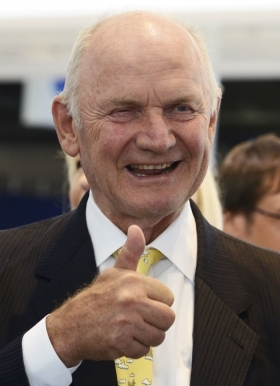 Volkswagen patriarch Ferdinand Piech said he may stay on as VW chairman beyond his current term and he sees room for the automaker to expand further. Piech is also concerned about the impact on Volkswagen of slumping new-car sales in Spain and Italy. Piech, 75, spoke with the German tabloid Bild am Sonntag in a rare interview. He said he would stay on until the new VW Golf, which went on sale on Saturday, is replaced. "I have asked (CEO) Martin Winterkorn to launch the next Golf. A new model of the Golf usually comes out every 5-7 years. At least that long I will cover Winterkorn's back as chairman," Piech said in the interview published on Sunday. In April, shareholders voted Piech to act as chairman for a third term until December 2016. Winterkorn's contract also runs until the end of 2016. Piech has been at the helm of VW for 18 years including nine years as chief executive officer. A decision of Piech to prolong his tenure would push back long-awaited succession planning. Analysts have been critical of Volkswagen for not bringing forward managers seen capable of leading the 12-brand car group. Asked by the newspaper if he expects a negative impact on Volkswagen from sales incentive programs of other carmakers, Piech said "For us, it will not be bloody." But he added: "We are worried about regions south of the Alps and west of the river Rhine. You'll hardly notice 5 percent plus or minus in Germany, but will notice two thirds less in Spain." Piech, who has made no secret of his interest in Fiat's money-losing Alfa Romeo unit, said VW has room for another brand that needs restructuring. VW recently acquired full control of Porsche's sports car unit and Ducati motorcycles. Piech is known as a tough taskmaster and he has pushed aside many well-regarded auto executives during his tenure at the top of VW. He said he regrets none of the losses -- except allowing Peter Schreyer to leave Audi to become Kia's design chief. "We should not have let him go," he said. Piech sees a future for plug in electric cars with range-extending gasoline or diesel engines but not for pure electric vehicles because of their limited range. Piech declined to take credit for VW Group's new MQB modular architecture, which underpins the new VW Golf and Audi A3 and will eventually be used on over 30 other models, including the Polo subcompact and the mid-sized Passat as well as vehicles from the automaker's Seat and Skoda brands, over the next four to five years. BMW introduced the idea of modular architecture with the 5- and 7-series models but VW under Winterkorn "had perfected it" to the point where it gave VW a competitive edge by expanding into over many models and brands, he said.